Manufacturer & Supplier of Stainless Steel Planters. Our product range also comprises of Railing Planter, FRP Planters. 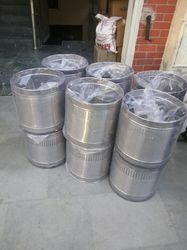 We are instrumental in offering Stainless Steel Planters to our clients. These are manufactured using stainless steel that we procure from our reliable vendors. These are highly popular to be used in residence, shops, office, factory, hospitals, shopping malls, hotels and restaurants. Variety of shapes and sizes are available for this product so that our clients get to chose as per their requirement. Also we make sure to deliver the product on time. No. 118, Kamal Estate, G. I. D. C.